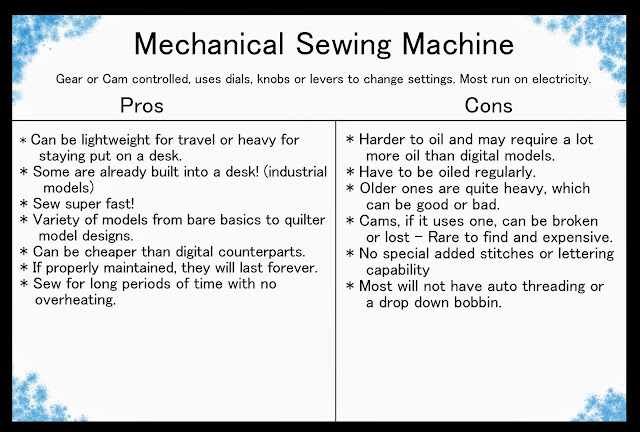 Finding the right sewing machine can be a real pain. Some machines are very intimidating, while others make you wonder if they will last during your project. Also, how do you take care of one once you have it? Shining Sakura is very passionate about her sewing machine and has been doing research on how to find the right one. She also has some great advice on maintenance and repair. Here is what Sakura has learned. Enjoy! * There are pro/con cards throughout the article. If you have any questions about what you see here feel free to contact VFire on the Contacts/Links page. Sewing machines come in all shapes and sizes. The one question many people ask is which one should I buy? Well that all depends on your budget and purpose. 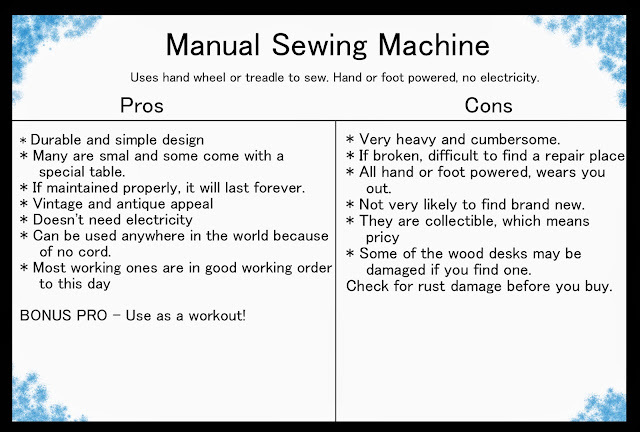 Here is a simple guide to help you determine which machine is best for you! 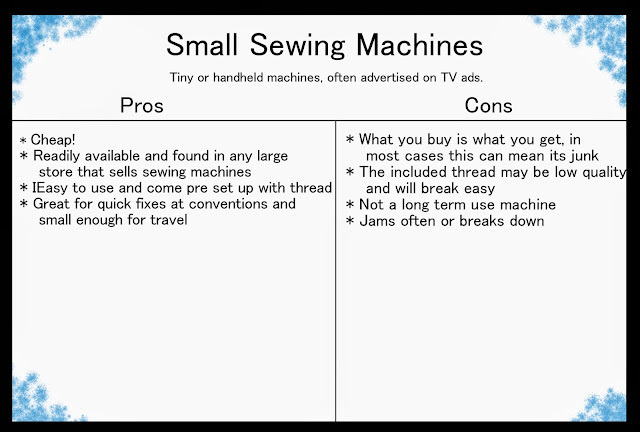 You do not have to follow this advice perfectly but it can give someone an idea of what to look for in a sewing machine. 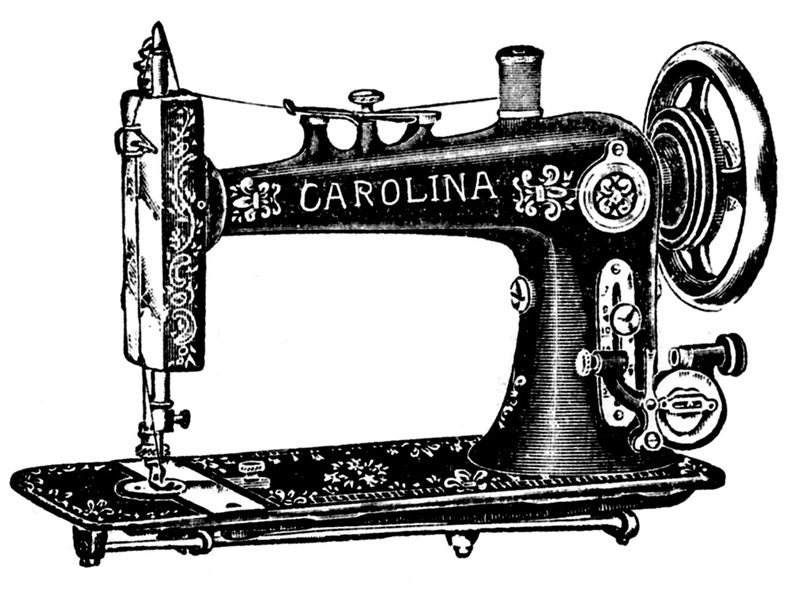 There are many sewing machines out there that have been running for over a century. In fact some of these early machines work better and longer than a good part of what is sold today. They built things to last back in the day. You will find that some machines built today not made to last on purpose! Buying old means that whatever problems or quirks are already present in the machine are already known. You know what you are buying and you can see how long the machine has already lasted. I personally have a machine that is over 20 years old. It has some issues with certain zig-zag settings when the needle is worn but it still works. I also have three year old, newer machine that has died. Guess which one I like more? Many film studios use vintage, all metal machines. They keep and keep and are quite durable. If you are looking for something to last you a long time it might not be bad to into a vintage, metal machine. It may be more costly but worth it in the long run. It is even better if you can find a European or Swiss vintage model. These machines are legendary and have an impressive track record for sunning smoothly for a long time. For me and my projects, this has been a god send and I have never looked back. 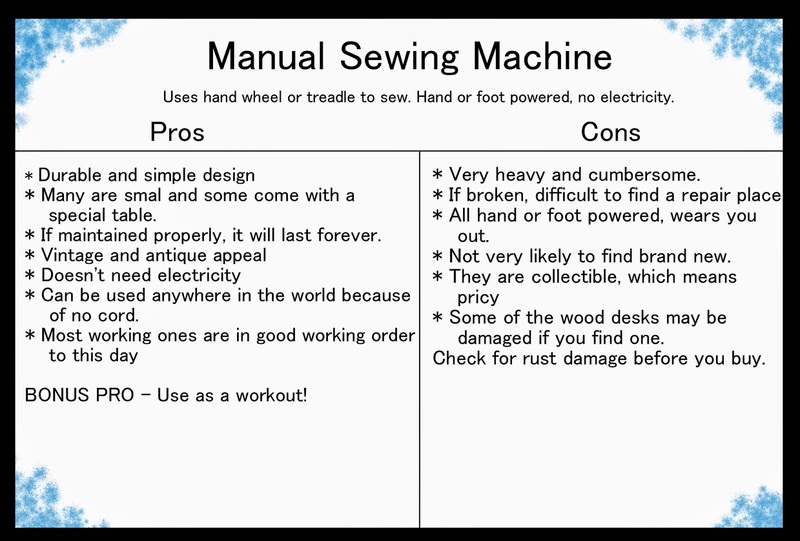 Example of a manual, foot petal sewing machine. the machine hooked up when little VFire did this! Older machines are quite plentiful, but always aim to try before you buy. Test out on different fabrics and settings. You might run into an old machine that hasn't been oiled or properly cleaned in years. Take that into account and take a look under the hood. If you are unsure of what to look for there are machine repair places all over Utah. Visit a store and ask them for advice or see if they will be willing look over a machine before you buy it. Buying older means the warranty is more than likely over, but you can take it in to shops to get repaired, Always try and get the preferred repair place for older machines. This goes for buying new machines too. 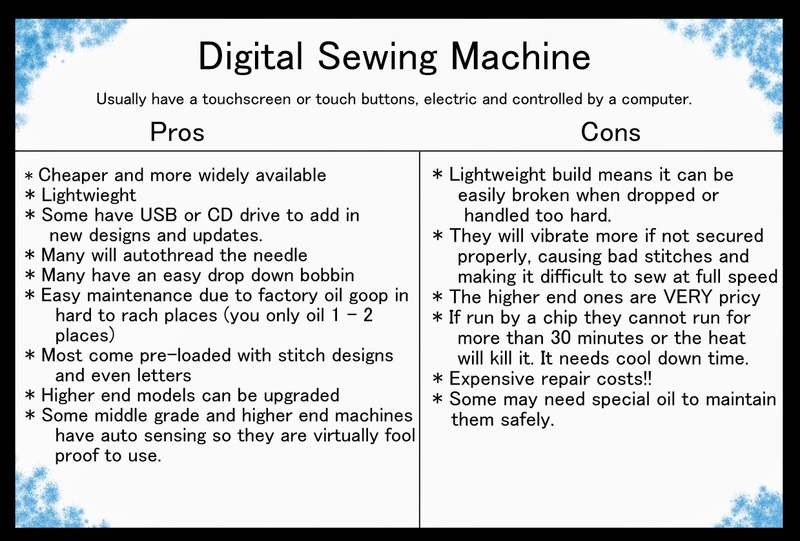 Machines like Bernina or other specialized machines can and will get ruined if taken to a general repair shop. Don’t risk it! Simple, newer machines are the ones to take to places like this that need simple tune ups. for the rest, find out which specialty repair shop is best for the machine. A quick internet search and calling around can offer the best answers. Buying old also means picking between metal, plastic, or half and half. Metal machines are much heavier, but usually that weight keeps it down on the table for a smooth sewing experience. Buying metal means looking out for rust damage! If it looks like it was in a flood judging by the dust case if it has one should be a BIG red flag. Avoid them! Usually the metal enamel keeps it safe though from the elements. Half and half makes for a good well rounded machine. It has metal to make it stronger and plastic for more lightweight frame. It has the pros and cons of both and is much more widely available today. Newer machines, if you want them to last, should be bought at a dealership. Stores like Walmart will have cheaper machines, but they may not last very long. they can be good if you are just starting out and are not sure if you like sewing or not yet. Its a good trial run to buy cheaper, but for longer lasting machines, try a dealership. The cheaper ones break very quickly and need repairs often. They can also have plastic feet (see diagram) that can damage your fabric and their motors cannot handle much abuse. Buying at a dealership also while more pricey, you usually get a nice warranty, classes on how to use the machine and its features, and usually they let you try it out before you buy! If it doesn’t cost at least $100 new, don’t buy it. Aim for around $150 to $200 for a low end machine. Unless you only want it for occasional small projects try to get a better machine. Your sanity will thank you for it! These machines are pricey and it is best to get one once you are certain you will use it enough to make the purchase worth it. Buying new is usually better than buying used. Most people do not take care of them and sadly run them into the ground. I have a used one, but I got real lucky. Make sure to test them out if they are used or run away! Take a class on how to use it if you can, it helps you and your sanity! machines, not the current brand equivalents. They do not compare to their older machines good name and vice versa. Buying from eBay can yield great buys or a monstrosity. Always ask the following of the buyer. 1. Why they are getting rid of it? 2. Ask for stitch examples. 3. Are there any issues or quirks? 4. Can they take a video of it running and send it to you? 5. Where did they acquire it from and why? 6. Does it include the petal? If they refuse to tell you any of this then you can probably assume they are a re-seller and the machine is more than likely inoperable. Don’t risk it, just move along. Many re-sellers or people in the know say they can’t test it because they don’t have the petal, which is important to making the machine work, or know it doesn't work they just want to make some money. Buying at say a Thrift store or garage sale can be good as well, just remember to check things out before hand. The machine may just need a simple fix like a tune up. You can bargain for a reduced price so you can have it tuned up at the store. School sales can be good too, get a cheap wonderful machine. They usually have something like the Bernina 1008 models… My dream machine right there. Be aware that they have a TON of miles on their machines and have been quite abused. I have a school machine and other than its odd zig-zag quirk and some scrapes on the outside, I LOVE IT!!!! The teachers take good care of the machines and oil them. The students mess around with the machines and give them that…err… character that you have to work around later. Most used school machines are 20-30% of the original sale price so it is a fabulous deal! Just try it out first! 1. 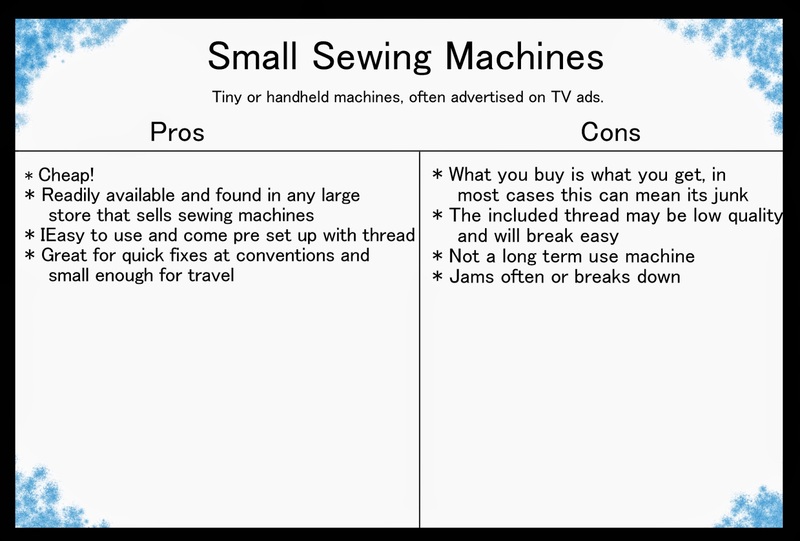 Buying a sewing machine is like purchasing a car, don’t go too cheap or you will likely get a lemon. 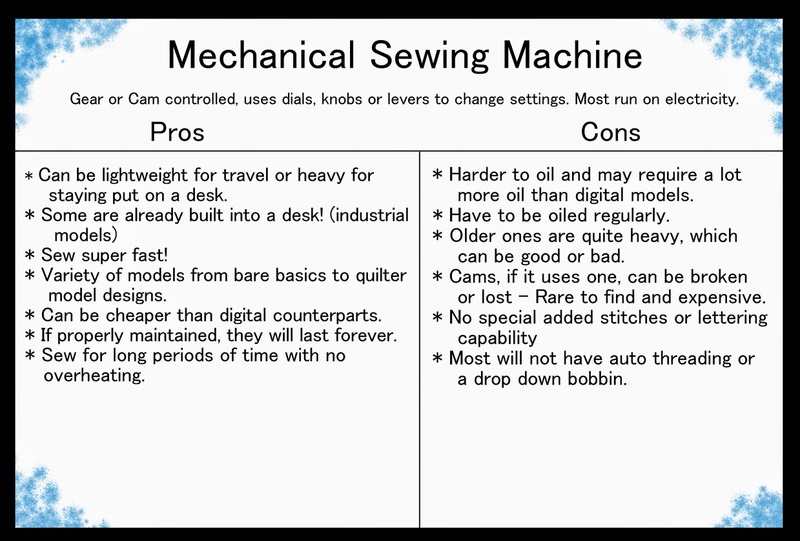 Not all sewing machines have to cost you over ten thousand dollars, but it should cost something, because it is an investment. 2. Maintain your machine properly or it will die early on. Pick one that fits you and your budget and make sure to take good care of it. 3. There is no such thing as a machine that never needs oil or cleaning. 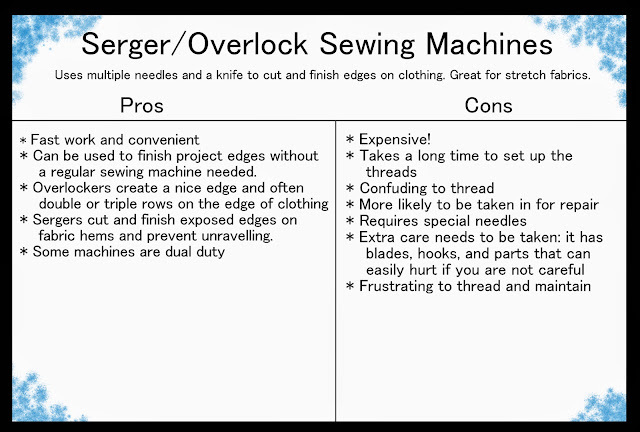 Often industrial serger machines literally sit in a pan of oil; thankfully home models don’t need quite that much oil. Once you find out how and where to place the oil, try to do this at the very least every ten hours of sewing or after every project, whichever comes first. This is just a general guideline; it doesn't hurt to do more. Remember to sew through a piece of scrap material afterwards until it runs clean. 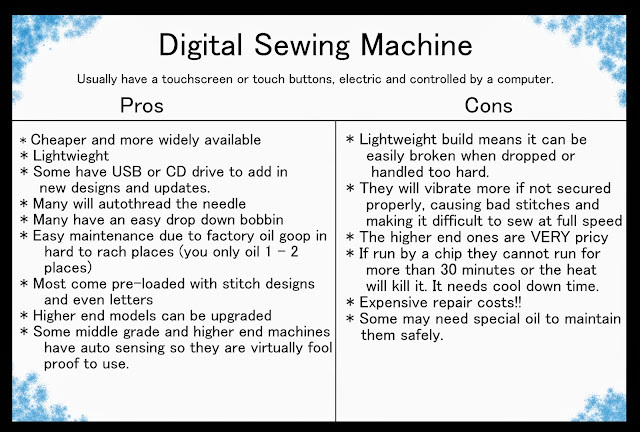 Most digital or new style machines only need one place oiled, in the bobbin area. Sadly because of the factory oil goop it can be prone to a buildup of fuzz from threads and need to be professionally cleaned out and new goop re applied. If your machine says otherwise, follow it. 4. Avoid using any super glue in cracks in the machine. Most plastics will melt, warp, or disintegrate. In fact avoid all chemicals unless specifically asked for by the manual or professional repairman. 5. Clean off thread fuzz from the bobbin case and thread feed areas frequently. Use the brush that comes with the machines or a tooth brush to get the lint looking thread dust out of your machine. Do not use "can of air," which blows air into the machine to clean it out, as it may push thread dust deeper into the machine parts where it may get stuck. When changing threads cut your thread near the thread spool and pull the remainder out the end near the needle. That prevents fuzz from coming loose into your machine. 6. Try and keep machines away from sunlight as much as possible while not in use or use a dust cover, this prevents dust collection and sun rot on the plastic. Wash off your machine with a lightly damp cloth every so often to keep any possible grunge, oil, or who knows what from ruining and staining your machine. If your machine has wood, make extra sure to cover it while cleaning and especially oiling, it will wick it up and cause stains or other possible issues. Note: newer models often have 3 and or sometimes 2 already taken care of for you. 3. The bar that moves the needle up and down. You can have access to it either by opening it up (not recommended) or by using a special oil container with a long straw like spout to drop oil onto it via the space around the thread take up lever (metal part that goes up and down that you pass thread through). Take it up and oil then down, this one’s takes the longest to do. Sergers and/or overlock machines have their own spots to oil and are noted usually on the machine itself. The holes have a wick in it that feeds the areas that need the oil so no worries of opening it up. 1. Undo the thread and re-thread it, sometimes it didn’t quite catch and went slightly off.